It is true “We are what we eat” our body reflects what are our eating habits and our hairs are no different. Hair length, texture, shine and appearance all depend on what we feed them. If you’re feeding them junk, fast food then won’t expect healthy hair. Every cell in our body needs proper nutrition to work efficiently. Seems difficult but not impossible to embrace healthy eating and opt nutrient rich rather than calories rich diet. Here’s a list of healthy hair nutrients that not only accelerate hair growth but benefit your overall health. Raw apple cider is a potent digestive aid. It not only aids digestion but also helps the body to absorb hair healthy nutrients. The potassium in a banana is integral in balancing pH levels, maintaining proper fluid levels, and the balancing of other minerals in the body. Like sodium, which in excess can dehydrate your skin and hair. Bananas are also rich in vitamin B6 and magnesium which help ward off scalp irritations and promotes healthier hair. Carrots contain a substantial amount of beta-carotene, a precursor of vitamin-A, which is necessary for shiny, well-moisturized hair and promotes scalp health. Vitamin-A also helps in the production of sebum, the natural hair conditioner. Carrots also contain magnesium, biotin, and vitamin-K which strengthen the hair. They are excellent sources of vitamins K, A, C and folate. All four will add fiber to your diet, enhance your digestive system’s ability to extract good nutrients from your food, help restore the body’s pH levels, and rehydrate the hair. It is excellent in promoting efficient digestion, is high in vitamin-C, manganese, selenium, bromelain, and copper which helps in the formation of collagen, a protein that helps the body to grow new skin and blood vessels to support the hair. Bromelain is anti-inflammatory and reduces the inflamed scalp conditions. Vitamin-C also helps in the production of sebum, the natural hair conditioner. Coconut water is one of the best natural hydrators. Key nutrients include lauric acid, iron, potassium (4 times more than bananas), magnesium, and calcium. Coconut water also contains bio-active enzymes and reduces inflammation and promotes hair growth. Flax seeds provide essential omega-3 fatty acids, vitamin B1, copper, manganese, and selenium which, by preventing inflammation, promote better hair growth. Pumpkin seeds are an excellent source of zinc, sulfur, and vitamin-A, helpful in building strong hair. 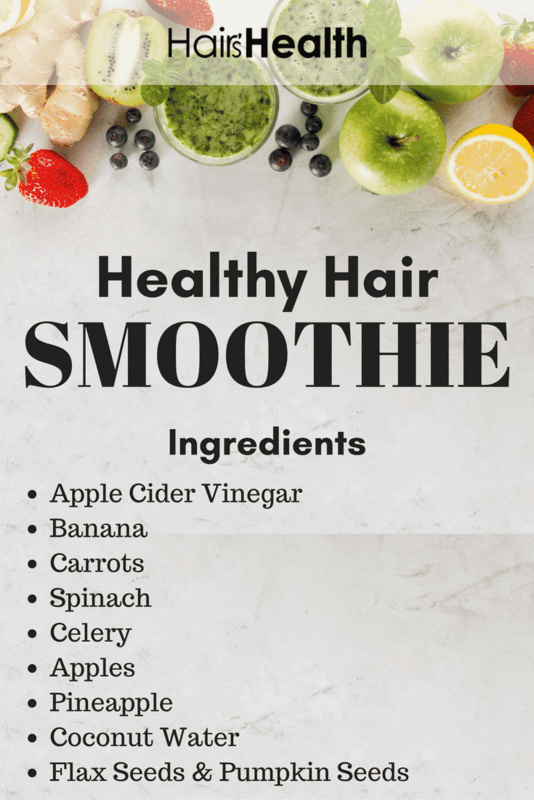 They also contain manganese, phosphorus, copper, magnesium, and protein, essential nutrients for strengthening hair, helping prevent thin and brittle hair, and increasing hair growth. It looks difficult to add all the above hair healthy nutrient rich foods in our daily meals but wait here’s a simple way to do that. It’s a Smoothie, yes hair healthy smoothie. Smoothie is a delicious way to blend healthy food that is not only easy to prepare but also easy to digest. Prepare different combos for a daily dose of goodness. Here’s how you can mix & match but it’s not limited, use your imagination. 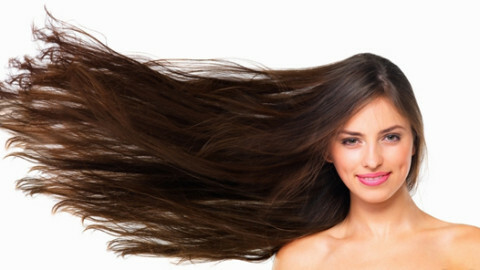 The purpose is to get a maximum of the above food items daily for healthy, shiny and vibrant hair. Which combination works best for you or have you tried your own combo. Share with us. Stay updated with our latest Hair health, style and nutrition tips.